An ever-increasing percentage of the world's population is creating and consuming content from the Web and social networks. Surrounding much of the content on these networks is advertising, be it banner advertising, keyword advertising, behaviorally targeted ads, CPM ads, CPC ads, interstitials... they're out there, in an effort to bring the host site some revenue. Despite the fact the Web offers an unprecedented amount of targeting to tailor the right message to the right people, I find we continue to be bombarded by off-topic, low quality garbage that certainly is degrading the reputation of the networks running the ads in the first place. Today's most recent jaw-dropper? 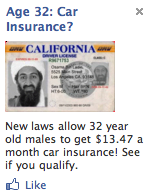 An advertisement for car insurance on Facebook that featured the bearded visage of America's least favorite terrorist, Osama Bin Laden. Now just whose bright idea was it that came up with the idea that Osama Bin Laden's stare was going to get me to change my insurance? Never mind trying to find out if the advertiser tracked down Osama and found out where he lives in order to send him royalty checks for using his image... one simply needs common sense to know that this ad is offensive, and yet it's pretty much par for the course on the Web. Combined with rump-shaking mortgage advertisers, Obama grins in medical scrubs and the like, and it's hard to believe we've made much progress from the dancing bananas, or punching the monkey, as we did in Web 1.0. 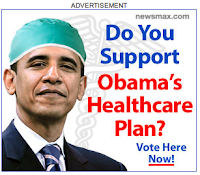 Do you think Obama approved the use of his image here? Put bluntly, the low-quality advertising directly damages my perception of Facebook and other networks where I see these ads. While the outlets may claim they did not personally approve every ad's content, it is part of the user experience I see when viewing their pages, and they definitely impact my experience. I have been asking companies like Facebook and others on the Web to leverage my social profile online and present me ads that are interesting. I once got so tired of Facebook's low-quality banners that I went on a rant and marked them all as offensive. But it seems like that hasn't had any effect, or the companies displaying the ads just don't care. Amusingly, I did a search on Google for the word "Targeted", and the first response, based on my login credentials, was that of a page on Facebook advertising. So what was particularly targeted about the Bin Laden ad? The advertiser said that 32 year-old males can get a specific rate on car insurance. Well, congratulations on figuring out my age and gender. But did I also sign up to be a "Fan of Osama Bin Laden" on Facebook? No. Nor did I put myself as a candidate for male breast reduction surgery over the weekend, or tell Facebook that I wanted to hook up with any hot single ladies looking for an "overnight match". In November, after hearing Twitter's promises that they would eventually debut an advertising system that we would love, I said I would embrace that approach. I am not anti-ads (despite my occasional complaints), but I am pro-relevancy. Before anybody says that beer commercials on TV and in magazines are offensive, and this type of approach is just making its way to new media, consider the likelihood of Geico or other auto insurance promoters pushing a photo of Bin Laden in a 30-second spot during Jeopardy or the Today show. It wouldn't happen. Why? Because it's wrong, they are professionals, and they know better. So why, when we have more opportunity to better target our ads, and we have customers willing to buy things online, do we get surrounded with such complete dreck? This is not acceptable, and I challenge companies that are enabling this train wreck to shape up.